Saquon Barkley, Adam Thielen and Nick Mullens are among the NFL players seeking statistical landmarks in Week 15 of the 2018 NFL season. The pick of the Sunday slate is the New England Patriots' trip to the Pittsburgh Steelers, with Mike Tomlin's team suddenly in danger of surrendering top spot in the AFC North following a three-game losing streak. With the help of Opta, we provide the details for what to look out for across seven of the biggest games. The NFL's longest winless streak on the road belongs to the Green Bay Packers, who have gone eight games without tasting victory on their travels. Packers running back Aaron Jones needs 280 yards in his team's final three games to become Green Bay's first 1,000-yard rusher since Eddie Lacy managed the feat four years ago. Indianapolis are seeking a fifth home win in a row for the first time since they won seven on the spin between October 2012 and September 2013. However, the Cowboys are aiming for a third straight victory on the road having not committed a turnover in either of those games. Should Dallas' offense not turn the ball over again on Sunday, it would equal a team record. Receiver Thielen will hope to continue his fine season. The Minnesota Vikings wide-out needs just 64 more receiving yards to become the eighth undrafted player in NFL history with at least 1,300 receiving yards in a season. The last man to reach that mark was Wes Welker in 2012. Meanwhile, Miami will be hoping to avoid losing a sixth straight game on the road. Barkley is eyeing up history again this week. 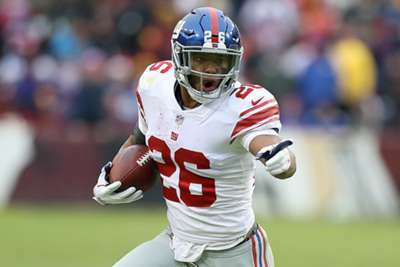 Having surpassed Odell Beckham Jr. and broken the New York Giants' franchise record for the most touchdowns as a rookie last week, Barkley can equal Tiki Barber's streak for most consecutive games with at least 100 yards rushing if he surpasses the mark for a fifth time in a row on Sunday. Seattle are looking for their 10th successive regular-season win over the 49ers, who have not recorded a takeaway in five successive home games - the longest streak in franchise history. Should San Francisco quarterback Mullens throw for 368 yards, he will surpass Cam Newton for the most passing yards in the first six starts of a career. Bill Belichick's New England Patriots have won five straight games against the Pittsburgh Steelers, including playoffs, the longest winning streak over that franchise in Pats history. The Steelers are bidding to avoid a fourth home loss this season. They have not lost four in Pittsburgh across a single campaign since 2003. If the Steelers are held to 40-or-fewer rushing yards for a fourth time in 2018, it will break a franchise record set in 1966. The defending Super Bowl champions are looking for a sixth successive victory against the Los Angeles Rams, who are 6-0 at home in 2018 and have gained at least 400 yards in each game. While Super Bowl LII MVP Nick Foles will start at quarterback for the Philadelphia Eagles as Carson Wentz is injured, Rams signal caller Jared Goff will be hoping to bounce back from a four-interception performance against the Chicago Bears last time out.